The more time we spend driving on the road, the more gas we consume. And the more gas we consume, the more gas we need to replenish in our vehicles. We can't control the price of gas but we can control how we use it. The best way to save up on fuel consumption is how the way you drive. For example, whenever I'm caught in traffic on a downhill slope, I switch gear to neutral and just use the brakes to save up on gas. Using the gas pedal downhill is useless since the car's own gravity will automatically make the car move in that direction. I'm pretty sure each driver has their own beliefs and practices on how to conserve gas. Pilipinas Shell supports this conscious effort to economize fuel and maximize performance. That's why they are inviting all motorists with valid driver's licenses to their search for the Philippines' Smartest Drivers. To join, simply share your fuel saving tip by recording a video explaining how your driving techniques minimize your fuel consumption . End your video by completing the catch phrase “Ang Pinoy na matipid sa gasolina, ____________.” Log onto www.topgear.com.ph/shellsmartestdrivers to upload your video. Submission of entries is from May 20 to June 20, 2010. All participants will receive premium items from Shell. Aside from that, ten finalists will be awarded 10,000 pesos worth of Shell fuel vouchers and will be invited to a fuel economy boot camp on June 26 where they will go through a driving challenge. The two most fuel efficient finalists will be hailed as the Philippines’ Smartest Drivers. On July 8 to July 11, the 2 winners will join Team Philippines from Mapua Institute of Technology, Don Bosco Technological College and the University of Santo Tomas in the first ever Shell Eco-Marathon Asia in Malaysia. They will compete with other drivers from other Asian countries and showcase their fuel efficient driving skills and techniques. Shell invites all Filipino drivers to share their fuel saving tips and driving techniques. Not only will they have the opportunity to win exciting prizes, but they will also be able to help fellow drivers to be more economical in their fuel consumption, which has been one of Shell's continuing efforts in helping motorists worldwide learn how to save fuel. 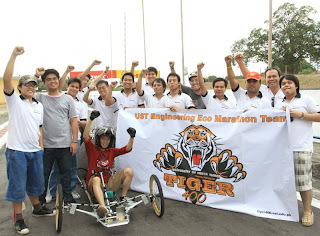 For complete contest details and mechanics, visit www.topgear.com.ph and click through the Shell Eco-marathon tab.